HomeExperience LevelAllAre Swing Mechanics Overrated? Since Halloween is coming here’s my scary statement – I think we focus too much on mechanics. Now read on and see if you agree with me. When it comes to hitting, I think we make a HUGE mistake when we focus too much of our instruction on mechanics. Sure, mechanics matter. And yes, they’re important. But solid hitting mechanics are simply a means to an end. That end being, to hit the ball. And more specifically, to hit the crap out of the ball! To Do Damage! Hitting the ball hard requires your hitters to be on time into the hitting zone. To do it repeatedly against all types of pitching, and against pitches in all parts of the zone does require consistency, and that can come with repeatable mechanics. So sure, mechanics help. But hitting the ball hard is the ultimate outcome and the mechanics of the swing are simply a way for your hitters to get there. 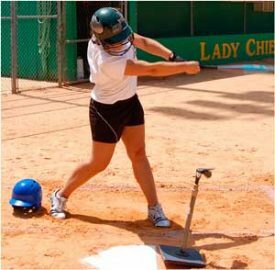 When mechanics are all that you focus on, instead of teaching your hitters that the purpose of the swing is to hit the ball hard, your players – especially your female players – quickly believe that having perfect mechanics is the outcome. And while you might know the reason you’re focused on mechanics is to help your hitters hit the ball hard or do damage, unless you actually stress this with your players, and reinforce it daily, you’re the only one who will know this. No hitter ever got an out overturned into a double because the umpire felt they had outstanding mechanics. Likewise, a crappy swing that results in a double stands as is. Mechanics simply create a solid base on which to dependably attack more types of pitches and pitching with the ability to repeat a great swing, over and over. Yes, work on mechanics with your hitters, but ALWAYS let them know that their goal and their focus is to “Be on Time” with the pitch and to “Do Damage” by hitting it hard! That’s the goal of every swing. The mechanics are simply parts of a swing to be tweaked or practiced in order to help a hitter get on time and do damage – but they are NEVER the goal of a hitter. Ever! Teach your hitters to Do Damage! For more help with Hitting, check out these 4 great eClinics. Your best VALUE – get ALL 4 of these eClinics, plus ALL of our online eLearning products in the Vault Classic. Join today! If you’re looking for College-Level Advanced Hitting Instruction – we’ve got you covered with the Hitting Summit Vault! Also, I believe many coaches look for the “perfect” mechanics and believe there is only one way/style to swing correctly. I will always believe that kids can swing very differently and still be just as effective. So glad to hear that. Our job as coaches is to make things easier for our players to understand, and by focusing too much on mechanics, we make things more confusing. i second ” i love this”!!! !